WASHINGTON--(BUSINESS WIRE)--Historic Hotels of America have some of the most magnificent and beautiful storybook gardens. Numerous life-long memories of special occasions celebrated in the gardens of historic hotels include romantic getaways, romantic proposals, honeymoons, anniversaries, and family reunions. Multigenerational guests select a historic resort to explore, experience, and grow their own ever-blossoming memories in beautiful gardens located at historic hotels. More than 70 massive live oak trees dripping in Spanish moss are a highlight of the resort's lush historic landscape. Each historic oak tree is numbered and receives monthly care for future generations to enjoy. Surrounded by brilliant Southern azaleas, roses, camellias, colorful annuals and lush vegetation, the Grand Oaks are legendary. Countless brides and families have taken portraits under the Grand Oaks. 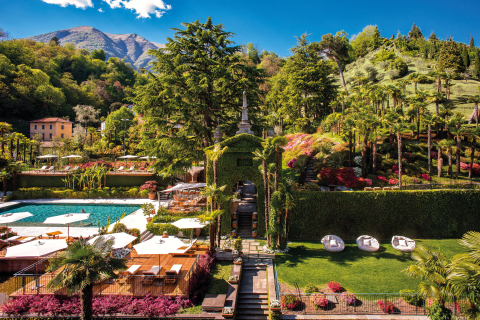 From a secret garden for customized meals for couples, to the chef's garden with more than 70 kinds of edible plants, Grand Hotel's gardens include 550 pristine acres featuring a stunning selection of color. The expanded estate garden offers beautiful flowers and fresh ingredients for use by the Grand Hotel’s chefs. 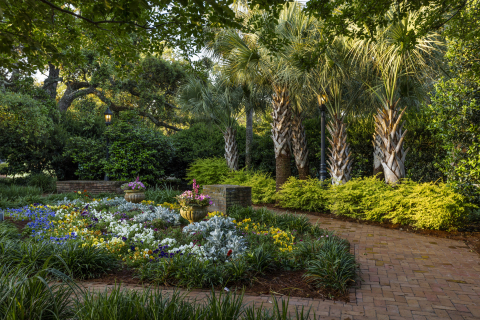 However, the Grand Oaks and fresh mint are the most beloved garden elements by guests and add to the resort's Southern charm. 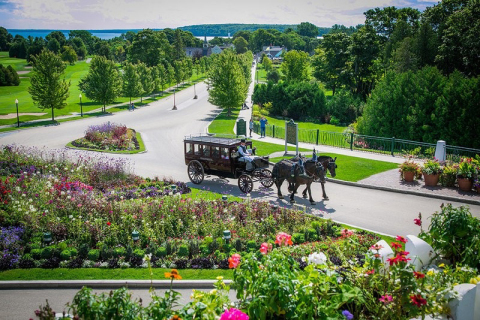 Countless annual and perennial seasonal flowers are added the Grand Hotel’s gardens each year. Many of these appeal to the Monarch butterflies which stop at the Grand Hotel on their way to Mexico each fall. The formal ornamental gardens at Mohonk Mountain House, designated a National Historic Landmark by the U.S. Secretary of the Interior, were designed to fit into what was described as ‘the picturesque or romantic style’ of landscape gardening: irregular in form, with variety and boldness of composition, and a scenery of a more rugged nature. One of the outstanding features of the gardens is the combination of sweeping lawns and open vistas with stately trees as focal points, surrounded by spectacular rocky cliffs. Various paths invite guests to wander beyond the formal area and into the rose, herb, and cutting gardens. Cedar-made pergolas, arbors, benches, and summerhouses handcrafted by Mohonk’s rustic carpenters over the past 150 years, enhance the natural aspects of the Mohonk landscape. In honor of the 150th anniversary in 2019, 20,000 tulip bulbs were planted and will be blooming April until mid-May. In honor of the anniversary, this year’s show garden theme is “Garden Jubilation.” It will be a study of classic Victorian cake tiered bedding style with a modern twist. Larger scale plants graduate to shorter bedding flowers in various sections of the garden. Both solid bed plantings and unique combinations are used throughout. Guests can view many classic Victorian annuals as well as many modern varieties. 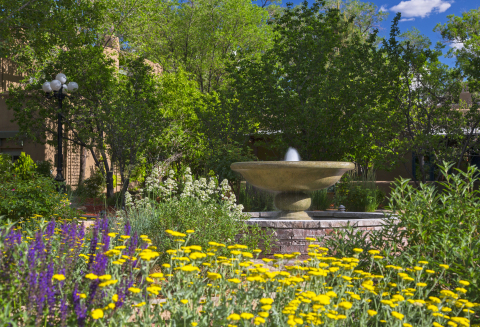 The gardens at La Posada de Santa Fe, A Tribute Portfolio Resort & Spa trace their history back to one of the original owner's, Julia Staab, and the garden she planted in the late 1800's. There are many walkways for guests to explore a variety of fruit trees, walnut trees, hickory trees, elm trees, aspen trees, and cherry blossom trees. Some of these historical trees are over 130 years old. Guests can view the beauty of natural grasses with a variety of roses, all shades of lilacs, butterfly bushes, and daffodils. The best time to see the most vibrant blooms is from May to September. Basin Harbor's historic 700-acre property sits on the shores of Lake Champlain and features over 15,000 square feet of gardens on site. More than 12,000 annuals are planted each year making a lovely backdrop for weddings, family portraits or morning tea. 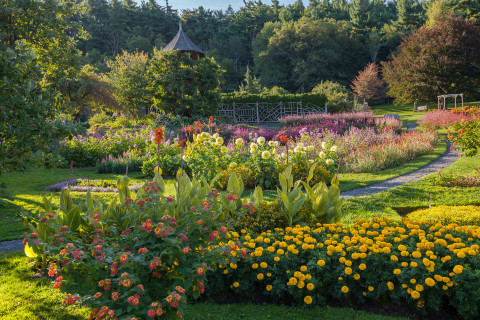 Basin Harbor's original gardens date back to 1911, when second generation host, Allen Penfield Beach completed his senior thesis at the University of Vermont on "How to Landscape a Resort" and took the thesis literally, laying out the blueprint for the gardens. Guests can enjoy the beautiful gardens from many cottages on property, an Adirondack chair or with 4th generation host Pennie Beach on one of her beehive tours. The historic Claremont Club & Spa has 22 acres of landscaped gardens. Included throughout the grounds are sumptuous rose gardens. Wild bees are welcomed at the Claremont, with a "bee hotel" on the grounds, designed in organization with "Pollinator Partnership" to encourage bees in the area and pollination in the gardens. The grounds at the Royal Palms Resort feature whimsical stone walkways, manicured courtyards, hidden gardens and fountains. There are many lush gardens that can be found at this historic resort, including the Alegria Garden. This private outdoor garden is enclosed by four stone walls and surrounded by vibrant flowers and fragrant citrus trees, making it a great location for celebrating significant milestones. The Jardin D'Amore (Garden of Love) is a sumptuous garden nestled in a quiet, intimate area of the resort with gorgeous views of Camelback Mountain. This 13th century castle has beautiful landscaped gardens surrounding it. With over 20 acres of gardens located on the castle grounds, there is no shortage of landscape to view. Guests taking respite in the Castle’s Elizabethan Conservatory have the perfect view overlooking the manicured gardens. The Garden Terrace is found in the beautiful courtyard garden of Sofitel Legend The Grand Amsterdam, dating back to the 15th century. One of Amsterdam’s best kept secrets; it is an oasis of peace and tranquility situated in the heart of the city. The courtyard is a perfect place for a relaxing drink, cup of coffee, business lunch or intimate dinner. The terrace is surrounded by historical walls and has a view on the balcony of the Marriage Chamber. The courtyard garden has retained many of its authentic Amsterdam School style features, from the time that The Grand served as the City Hall of Amsterdam. A good example is the sculpture created by Amsterdam-based artist Jacob Kaas, dating from 1931. Villa Cipriani was designed by architects of Andrea Palladio’s school, back in 1500 as were the gardens. Palladian villas were originally built as leisure second homes where wealthy Venetians would spend summers away from the heat of the lagoon. The gardens were places where social life was conducted, conspiracies were plotted and romances bloomed. Villa Cipriani’s garden through centuries has maintained the original landscaping, as a terraced garden overlooking the surrounding woods and the mountains, the "thousand horizons" that gave the town of Asolo its nickname. The garden changes color and scent with every season and its unique charm endures through centuries. The Mayaland Gardens are located in the heart of the archeological park in Chichén Itzá, Yucatán, Mexico. They have been nurtured by six generations of Barbachano Family members since 1923, occupying an area of over 10 acres, of the 550 acres of tropical forest the hotel possesses. The original plantings came from Hacienda Uxmal in the 1920’s, consisting of native palm trees and flowering trees of the region. Most predominantly were the plantings of Royal Poinciana trees, known in Yucatán as the “Flamboyan," although of African origin, since the XVIII century have been the flowering trees most associated to local landscapes depicting Mayan and colonial villages of Yucatán. There are over 100 varieties of flowering trees, flowers and ornamental plants found in these gardens. The southeastern area of the tropical forest is the most tranquil. Washington DC based Historic Hotels Worldwide® is a prestigious collection of historic treasures, including more than 360 legendary historic hotels including many former castles, chateaus, palaces, academies, haciendas, villas, monasteries, and other historic lodging spanning ten centuries. Historic Hotels Worldwide recognizes authentic cultural treasures that demonstrate exemplary historic preservation and their inspired architecture, cultural traditions, and authentic cuisine. Historic Hotels Worldwide along with Historic Hotels of America are official programs of the National Trust for Historic Preservation (United States of America). HistoricHotelsWorldwide.com allows travelers to book their next getaway from more than 3,000 historic and cultural experiences, and view special offers at participating historic hotels from 43 countries. To be nominated and selected to be featured on this supplemental marketing program website, historical lodging properties must be at least 75 years old; utilize historic accommodations; serve as the former home or be located on the grounds of the former home of famous persons or significant location for an event in history; be located in or within walking distance to a historic district, historically significant landmark, place of historic event, or a historic city center; be recognized by a local preservation organization or national trust; and display historic memorabilia, artwork, photography, and other examples of its historic significance. To be selected in the United States for inclusion in Historic Hotels Worldwide, a hotel must meet the above criteria plus be a member of Historic Hotels of America. For more information, please visit HistoricHotelsWorldwide.com.